can someone explain the purpose? It's to avoid cheating is what I have come to determine from the forums. How even can you cheat cw by transferring? They do realize time is a finite resource Even if you instant change clans any battles you partake in still take time. Its not like you get any more battles or extra time And rewards are by account, Once you claim them that's it. You switching clans changes neither the days it happens on, the rewards you already claimed, nor the potential games you can participate in. it's not like wows didnt have mercenaries before and that option isnt available for clan battles despite being offered on other WG titles. it seems like an arbitrary inconvenience. sometimes you are 1 person short; you have people who can help but this system kinda denies you that; and you miss out on a day; and for clans with busier people who have limited days (work, kids, family, church) this seems like a real [edited]pain when you could get that vital last player with the old rules. it seems alot of people were in favor of this too, but they cant articulate any real reason beyond "yeah screw those cheaters!" I'm asking because i feel like a 24 hour wait (if there *HAS* to be one) would be less of a hassle and cater to any players so worried about this so as to implement this in the first place. 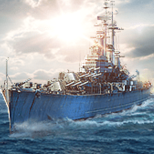 USS Wichita now going to be promo ? According to the wiki http://wiki.wargaming.net/en/Ship:Wichita USS Wichita is now a promo ship. Kinda sad as I was really looking forward to buying her. Is this actually the case ? She really going to be strictly a promo ? When can I sell my premium CVs for Dubloons? See Title. I just sold my saipan and didn’t get Dubloons. Opened a ticket and hoping to get my CV back although as soon as i can get Dubloons it’s getting sold again! Anyone know? When are Santa crates being removed from store? Hi Folks... I haven't seen anything indicating when the santa crates will be removed from the store. Any idea when this may happen? So for the first time in my experience i came across someone who put a kill on me that made me think something wasn't quite right. Generally, i was in a difficult target, unspotted, maneuvering, yet bulls-eyed (i was the only nearby target, not incidental) by a high dispersion class ship at long range. so, my question is: IF someone were using an aim-bot, what would his statistics look like in terms of hit rates. also generally how would it be detectable by wargaming? and before people jump on the denial bandwagon, this is from the wargaming website: "Auto-aim or so-called aim-bots that provide more functionality than the aim lock in the vanilla client, specifically including those that aim at the enemy's weak spots and/or lead the aim automatically" thus, they do exist. There are two fundamental questions that I do not have an answer to after reading many posts/videos about proper aiming: It is obviously shell travel time and target speed affect lead, but how about target distance? Should I lead the same ticks for a ship at 10km and the same ship at 20km which travel at same speed/direction and with (assuming) equal shell travel time? For my experience in game they are not the same but many articles tell us you lead the same ticks as shell flight time for a battleship sized target moving at 20 kt without mentioning/saying regardless of distance. Furthermore, there is a custom dynamic crosshair in Aslain's mod called "Nomogram" whose tick mark's intervals change according to target distance (not zoom level when you scroll the mouse wheel). Someone recommended it greatly Here in 2017, but not many people had interest in it. Why are 99% of players using the bow as the reference of aiming? When talking about lead, naturally we make prediction of where the shells will land after some time. However, all the tutorial videos about aiming put the prediction tick mark at the bow whereas they expect the shells to land at the center of the target. This makes the lead calculation illogical and people need to adjust lead according to different sizes of ships (lead more for smaller target). Imagine that you want to shoot a moving animal's head, naturally you will aim at the head but not at its feet expecting to hit the head, right? The more I played the more unreasonable I feel about this. There is only one topic date back to 2016 that proposed the theory of aiming at where the shells will land (Check here). I feel the theory is somehow in the right direction but he a) ignored the distance impact and b) he has no solid proof of the speed the crosshair is calibrated for, which are 12 kt (static) and 21.5 kt (dynamic). I had played over 5k battles in wows at which time my aiming is not too bad I believe. I can hit where I want 90% of time regardless of target ship type, speed or angle. Then I decided to switch to dynamic crosshair from static since I watched many CCs and unicum players using dynamic crosshair. Another reason is that I play DM/Worcester/Atlanta a lot. Under static crosshair I often have to aim out of the tick marks or even the binocular sight due to the slow shell speed. Then for the recent 50 games I totally messed up with aiming. I found that I could not hit anything reliably and that is why I wanted to start doing research on all this math/calculation theory. I know that many people will just aim by eyeball and experience, and it works perfectly. When you have 10k battles maybe aiming is just a matter of muscle memory. If you play wows just for fun and leisure then you may feel this topic meaningless. However, personally I just want to have a more logical/mathematical calculation of lead because we all know wows is a math game despite those crappy RNGs. We have 14.3 overmatch coefficient, 1/4 or 1/6 HE pen threshold, IFHE pen threshold, etc. If anyone wants to play well in wows he/she has to remember these numbers and makes use of it. Another benefit is having an accurate aiming mechanic can help people adapt to any ship faster, not only for novices but also for experienced players. Think about playing a Worcester after you played dozens of games in Moskva, by experience I know I have to lead more, but how much more? I may need another 3 games to re-adapt to the DM, while with a precise calculation, I might be able to re-adapt in just 3 salvos. Long words in short, what do you guys think of how exactly the aiming system works? Is it possible to set it where the voice mods only affect your quick chats and not everyone else's on the team? For example, if I set my voice mod to be ARP Kongo, is it possible to make it to where I hear the Kongo voice over for my quick chats, while everyone else's quick chats use the default national voiceover? New tier 6 and lower price change. I've heard that the Price change to tier 6 down will be Permanent next patch. so that leaves the question... Will Players who have already researched tier 6 and lower ships get Compensation? Example is I've researched 18 of the line to tier 6 at least. So when you consider the lower price then that adds up pretty quick to Credits and XP spent. I see this torpedo looking thing on many ships. Can someone tell me what it is? Why can you not division up in Ranked Battles?